Glorious fall. In Texas, fall counts as when the temperatures stop regularly cresting 100 degrees Fahrenheit. A high in the mid-80s brings people out of their homes in droves. Including me! Although it’s still very strange to see the September sun and be sweating like a pig, it’s comforting to know that time does, indeed, pass, summer doesn’t have to last forever, and you can go outside without immediately desiccating. Sticking to medians, the grassy playground of the nearby school, and other unpaved common areas, I did eight 30-second sprints during my walk, covered 2.2 miles, and felt pretty damn good at the end of my 36-minute outing. 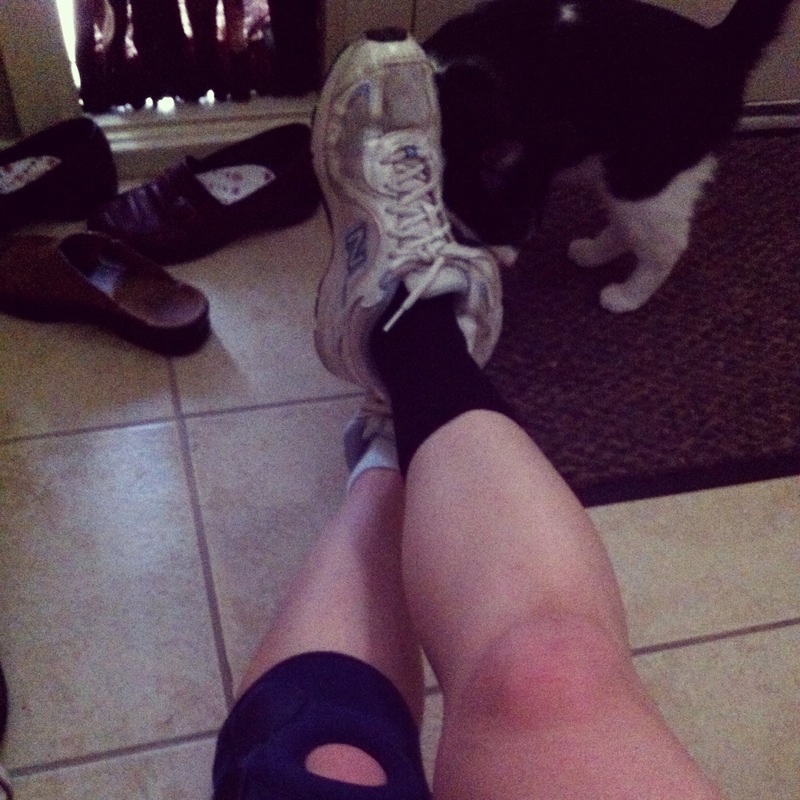 Post run relaxation, aided by my chief medical officer, the cat. When I got home, I iced down first my bad knee, then my bad ankle. The next day, those joints were just fine. The only things that really hurt were my right foot (I broke a bone in it several years ago, I think; never got it treated, and who knows how it healed) and my abdomen. I’m still kind of healing from this summer’s injury, which my doctors determined was probably torn scar tissue from my gallbladder surgery two years ago. So running was not the wisest thing I could have done, even though it felt ok at the time and was a major mental victory. I’ll have to keep moving slowly until I’m fully healed up. If my abdominal problems persist after a few months of taking it easy, it will be time to go to the doc and ask whether I can get an ultrasound or something, investigate whether there’s a tear that needs to be addressed with either stitches or magic. As many people who live with chronic injuries or weirdo conditions or undertreated medical problems know, it’s a pain trying to stick to a regular workout routine when you don’t know how your body is going to react each time. A setback can either be a few days of pain, a month of nausea, six weeks of limping, weeks of physical therapy, surgery, or nothing, and you never really know what time bombs are lurking, waiting for you to twist a joint the wrong way or aggravate a weakness or latent problem enough that it comes to the fore of your consciousness through physical exertion. I think all we can do is keep going and keep trying to improve our health. We can be afraid forever of testing ourselves, or we can reach too far and hurt ourselves, and we never know for sure which it’s going to be. I hope that I can get past the limitations of my body and run one day. My obstacles are not insurmountable. I just have to find out what my problem is and deal with it. A trip to the doctor in the next few months may be in the cards. I’ll have to wait until everything settles down a bit first – my personal life is about to undergo a huge upheaval – but I intend to take care of myself to make my goals more attainable. This entry was posted in fitness, health and tagged 5k, Exercise, fitness, goals, health, injury, walk, workout wednesday. Bookmark the permalink.